Herb Quay died on March 7, 2019, at 91 years of age. Herb’s lasting influence on the field is so basic and profound that, ironically, much of it may be invisible, particularly to younger generations. We all know Herb as the founding Editor of the Journal of Abnormal Child Psychology and many of us know that he was the founding President of the International Society for Research on Child and Adolescent Psychopathology. In founding the journal, he both inspired the study of child psychopathology and gave the small but rapidly growing cadre of scholars in this area a place to publish our papers. It’s hard to credit now, but there was a time when APA journals had little interest in empirical papers on child and adolescent psychopathology. I had the good fortune of attending an editorial meeting of JACP in the 1980s. The members of the editorial board stayed late after the business meeting was over to talk shop and gossip. Herb had the idea to launch ISRCAP to give us a regular venue to continue the conversations. Like the journal, ISRCAP provided the muscle and bones of a vitally important incipient field of research. It only seems like psychopathology research that takes a developmental perspective has always been part of mainstream psychology and psychiatry, but it was not always that way. Herb’s bold and prescient ideas helped kick the field into existence. We all owe him a tremendous debt of gratitude just for those organizational contributions, but of course, Herb was a consummate developmental psychopathologist himself who made innovative, important, and lasting empirical and theoretical contributions to the field. Herb’s earliest research focused on psychopathology among institutionalized children and adolescents, particularly incarcerated delinquent youth (Quay 1964a, b; Quay and Peterson 1960). His studies led him to distinguished subtypes of juvenile delinquents that are still used today to assess risk for recidivism based on the presence or absence of psychopathic traits (Johns and Quay 1962). This idea is, of course, echoed and expanded in the current research by Paul Frick and others on callous-unemotional traits, work that I often heard Herb applaud. Herb also was perhaps the first to suggest that sensation seeking was a key feature of psychopathy in youth; his 1965 paper on this hypothesis (Quay 1965) has been cited 230 times, including eight citations in 2017–2019. His seminal and enduring ideas on the heterogeneity of antisocial behavior are summarized in his still relevant Handbook of juvenile delinquency published in 1965. Around the same time, Herb wrote extensively on the education of children with psychopathology in the early 1960s. Indeed, Herb, John Werry, and their colleagues published on perhaps the first adaptation of Gerald Patterson’s behavioral parent training methods for children with behavior problems by teachers in the classroom (Quay et al. 1966). These and other papers laid the foundation for contemporary behavioral approaches to special education, such as those led by Bill Pelham. In my view, however, Herb’s most profound contribution was to how we think about and measure psychopathology. 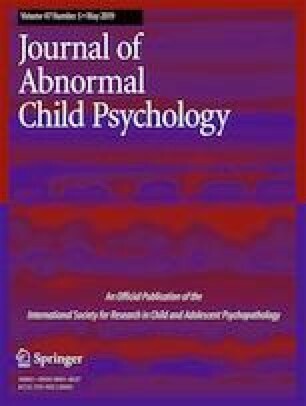 Consider for a moment the fact that the field of child and adolescent psychopathology has seemingly always taken a dimensional approach measuring and conceptualizing mental health, whereas adult psychopathology is just discovering the virtues of empirically defined dimensions instead of consensus defined binary diagnoses. It is likely impossible to tell who first started us on this path, but the first papers I can find on the use of factor analysis to define dimensions of child psychopathology were co-authored by Donald Peterson and Herb Quay in the late 1950s (Peterson et al. 1959). Perhaps we would have found our way to the dimensional approach anyway, but Herb’s early papers were foundational. For example, his 1965 paper in Child Development defined what is now termed internalizing at externalizing psychopathology in children and adolescence (Quay and Quay 1965). His single strongest influence on my own research was the groundbreaking chapter on classification in Psychopathological disorders of childhood, edited by Herb and John Werry in 1972. It is still good reading; it is outdated only because it stimulated the mountain of future research that, of course, is not covered in it. In the 1980s, Herb introduced me to Jeffrey Gray (Gray 1978), who had just published the first version of Neuropsychology of anxiety. Gray had put forward a bold model that applied findings from his rodent work on avoidance conditioning to problems of anxiety. Herb was the first to suspect that Gray’s ideas on the role of reward seeking and response inhibition also could be profitably applied to attention-deficit/hyperactivity disorder and conduct disorder. Two of Herb’s most highly cited papers offered the details of these hypotheses (Quay 1993, 1997), including his 1997 paper on ADHD in JACP. This influential paper has been cited 329 times, including 16 citations in 2017–2019. Personally, Herb was the most important intellectual influence on my academic career, and he was one of my favorite persons ever to live. He had very few peers in my view. Herb was kind and caring, but he was influential because he was dominant, clear thinking, and outspoken. I did not study with Herb, but I met him early in my career and he remained an informal mentor until his death. I have often joked that Herb and I were friends because we thought everything the other said was absolutely correct! I am sure, however, that Herb was just too kind to mention when my thinking was off the mark. We became friends in part, too, because of our common background. When we first met, we realized that we had both grown up in St. Petersburg, Florida, and both had graduated from St. Pete High. We shared recollections of beaches, sunburns, sandspurs, and drinking water from the Fountain of Youth in Bayfront Park. This artesian well spouted the foul-smelling sulfurous water that some clever wag rebranded as elixir from Ponce de Leon’s mythical Fountain of Youth. It was a big attraction for the many retirees living in St. Petersburg, drinking the stuff either naively or with tongue-in-cheek. If nothing else, memories of holding our noses and drinking that water as children was part of the enduring bond between Herb and myself. He will be dearly missed by many, including me.